Based upon the success of its pilot, Health Leadership International signed a five-year Memorandum of Understanding with the Lao Ministry of Health to expand the training and take it to provinces around the country. Lao Health Ministry officials requested course content in three critical areas: (1) Clinical, (2) Health Leadership, and (3) Medical English. 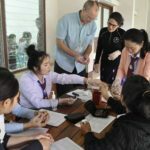 In November, a twelve-person team returned to Lao PDR to conduct a two-week training in basic primary care for village health workers, in medical leadership for district hospital staff and in Medical English for Health Professionals. The training was hosted by Virack Vidamaly, MD, Hospital Director. 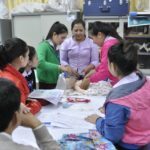 HLI modified its approach based upon evaluative data from the previous year and put into place a train-the-trainer model whereby each HLI medical professional was paired with a bi-lingual Lao medical professional who will co-teach the course. 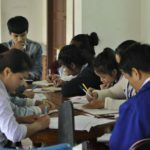 All curriculum materials were translated with PowerPoint presentations featuring side-by-side translation in both Lao and English. 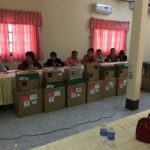 Upon completion of the training, Lao co-trainers were given copies of all curriculum materials so that they would be able to train others after the Health Leadership team left.